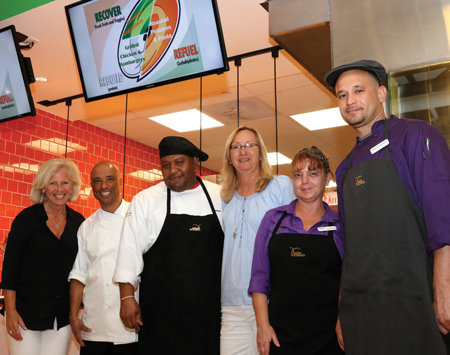 Celebrating the huge success of raising $120,000 for the Dolphins Cancer Challenge and BikeMS, the Mack Cycle & Fitness Team felt at home in the Canes Zone Dining Hall on the University of Miami campus. 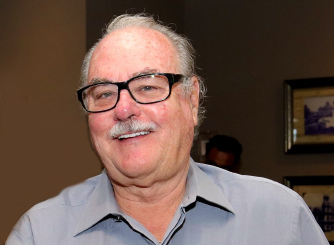 Usually reserved for UM’s athletes, the restaurant served a feast deserving of the 2016 Mack Cycle Team members who trained, raised big dollars for the charities and crossed the finish lines in true champion form. 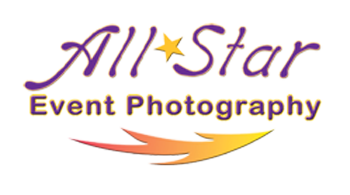 Top Team fundraisers won valuable cycling prizes for their efforts, including full carbon bicycles, wheelsets and Go Pro cameras. 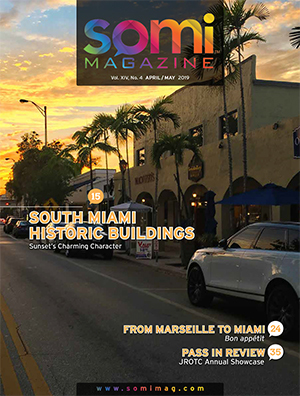 Mack Cycle owner Mary Jane Mark received assistance from Miami Dolphin Nat Moore in awarding the prizes. 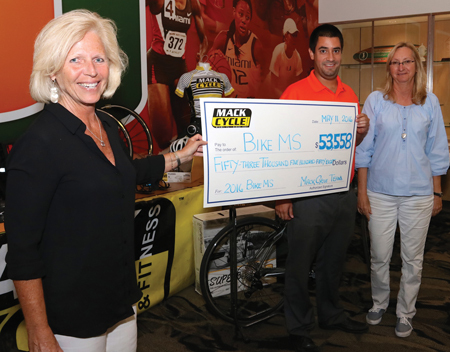 Mack Cycle & Fitness presents a $66,179 check to the Dolphins Cancer Challenge. 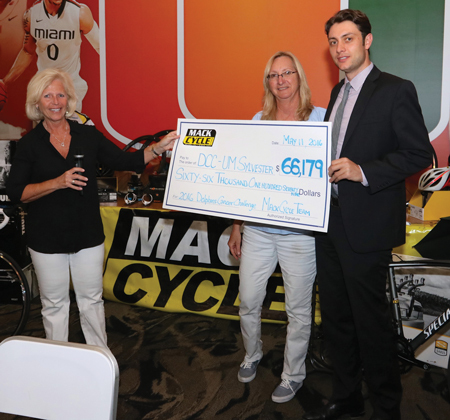 Pictured are Sue Kawalerski, Mack Cycle’s Advocacy Coordinator, Mary Jane Mark and DCC’s Chris Allen. 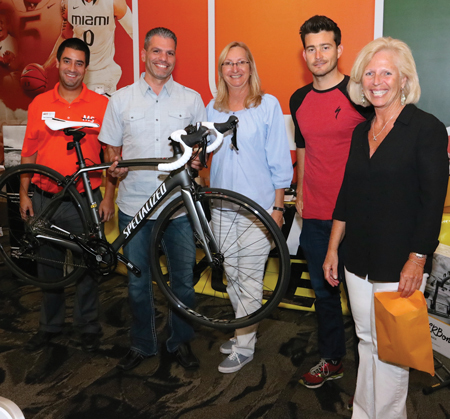 Leo Gonzalez (second from left), was the #1 Team Fundraiser ($4,278) for Bike MS and winner of the MS Bicycle Winner. 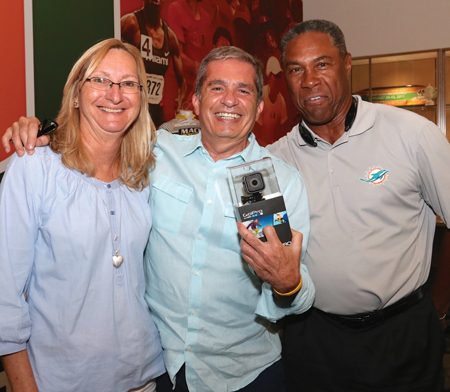 Joining the group is Camilo Jimenez, Specialized Rep.
Miami Dolphins Alum Nat Moore joins Mary Jane Mark in presenting a GoPro Camera to DCC team member Gabe Yanni. 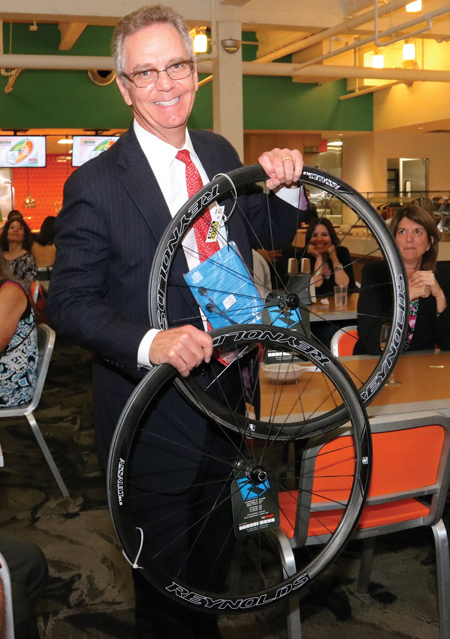 Top fundraiser ($17,454) DCC Team Member Robert Merlin is the winner of a carbon wheelset. 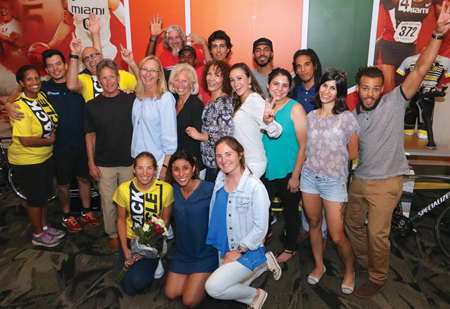 Bike MS Team member MariaLuisa Hoover celebrating.